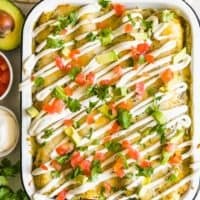 This HEALTHY CHICKEN ENCHILADAS Recipe (Chicken & Sweet Potato Enchiladas) are a healthy and delicious way to enjoy Mexican night! We love these tasty sweet potato black bean enchiladas and make them on the regular. This Skinny Chicken and Sweet Potato recipe is filled with vegetables and all kinds of good stuff. They are definitely a new favorite! 1 can yellow corn kernels drained and rinsed. I used Green Giant Steam Crisp corn...it doesn't come in liquid so I could use 'as is'. it was really good!